Boogle is absolutely free with no strings attached! 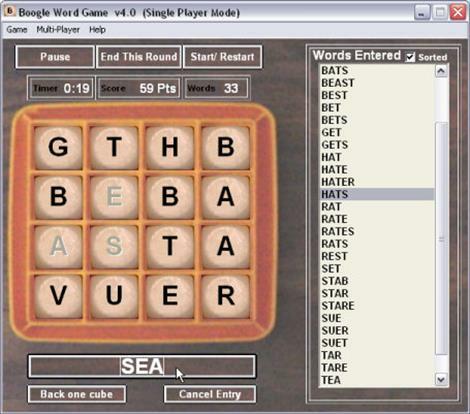 If you like word games, you’re sure to like Boogle. Not only is it fun, but it can help build up your vocabulary and spelling skills. Boogle has two modes: Single Player Mode and Multi Player Mode. In Single Player mode, it is a one-player only game, and you do not play “against” the computer. It was made simply to kill time. It has a High Score system, which stores the 10 highest scores, and includes a built in spell-checker. In Multiplayer mode, you can play against friends over a LAN or the Internet. Please see the included Help File for more information on multiplayer games. Although it has been given a bit of a facelift over the years, Boogle is the FIRST program I ever wrote for the PC, back around 1996, and I am thrilled that people enjoy playing it today! Boogle is absolutely free with no strings attached! It contains no viruses, spyware, or adware. It was a great way to help me learn programming back then, and I never intended to make any money off of it anyway. Enjoy!